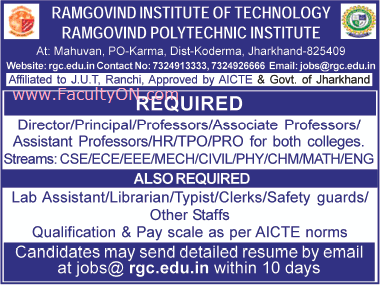 Ramgovind Institute of Technology, Koderma has advertised in THE TIMES OF INDIA newspaper for recruitment of Professor / Associate Professor / Assistant Professor / Principal / Director / HR / TPO / PRO jobs vacancies. Interested and eligible job aspirants are requested to apply within 10 days from 5th December 2018. Check out further more details below. About College : RAMGOVIND GROUP OF COLLEGES (R.G.C.) was established in 2004, in joint collaboration (PPP mode) with Govt. of Jharkhand, under special initiative by Govt. of Jharkhand to promote technical education in the state, with two colleges, Ramgovind Institute of Technology (R.I.T) & Ramovind Polytechnic Institute (R.P.I) as its wings. The Institutes are being developed under the able guidance of experienced Technocrats, Engineers and Academicians from all parts of the country as well as globally.